Sir Peter Scott’s diaries reveal above all his overriding concern with conservation. Human behaviour, history, culture and ideas also come under the scrutiny of his candid and discerning eye. The last volume records his travels in Japan, Indonesia, Hong Kong, China, Mongolia, the Phillippines, Malaysia, Australia and New Zealand. 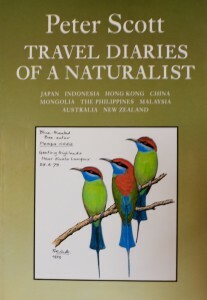 Buy Travel Diaries of a Naturalist Volume III on Amazon.